Students from schools and colleges around the Bury St Edmunds area have had great first-hand experience learning about science, technology, engineering and mathematics (STEM) in the workplace and how it is used in an industrial setting. 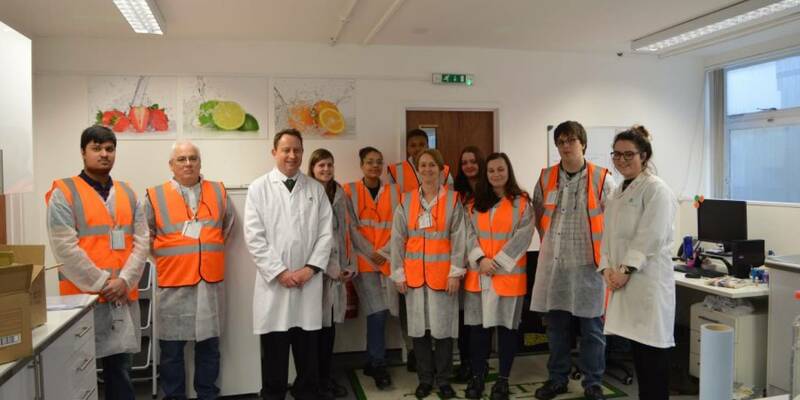 Students aged 18 and 19 from Suffolk New College in Ipswich attended and following a site tour of the R&D labs, the students were given the opportunity to smell and taste some of Treatt’s flavour and fragrance ingredients in the Treatt applications laboratory. Members of staff from Treatt were also on hand to answer the student’s questions and to explain about the kinds of skills and qualifications required to work in the company. Jane Taylor, Lecturer in Biology and Science at Suffolk New College commented, “The students had a chance to see how a manufacturing unit operates and how the products can be tested in a laboratory. They also discovered how essential oils are produced for the food and fragrance industries and the way that the raw materials are sourced from around the world. I overheard students saying how much they had enjoyed the visit and that they were excited by the idea that this type of work was something they could realistically access with their Applied Science course,” she added. Both Suffolk New College and Treatt are keen to consider future visits for students and also to keep the connection so that opportunities for local student employment can be pursued. Treatt is keen to work with other schools in the area in order to expand its educational support and can provide bespoke packages of information dependent upon age of students, curriculum and the requirements of the school. Treatt has also been involved in the STEM careers event at West Suffolk College, the lunchtime Science Club at St Benedicts School and will be taking part in the Science Fairs at County Upper School and King Edward VI School w/c 13 March, all in Bury St Edmunds.